Quick Answer: However unexpected it might be to think of Elvis as a noir figure, if we consider film noir a style rather than a genre, we can read King Creole a noir musical. Historically, King Creole comes near the end of what is generally considered the original or classic noir “cycle.” Elvis’ final film before he enlisted, it showcases the dark, rebel image that meshed well with his sexually charged performance style. In conjunction with King Creole’s classic noir cinematography, the film explores the moral and racial connotations of light and dark through the presence of African American music and New Orleans life. Film noir is sometimes identified as a genre, but it is perhaps best understood as a style. With such a designation there is no contradiction in identifying a film as a “noir musical.” This label has been used for such films as Blues in the Night (1941) and Gilda (1946), and scholar Sheri Chinen Biesen has devoted an entire book to the subject, Music in the Shadows: Noir Musical Films. In such context, we can read King Creole (1958) as a noir musical, however unexpected it might be to think of Elvis as a noir figure. Historically, King Creole fits into the later years of what is generally considered the original or classic noir “cycle,” a group of dark, cynical Hollywood films that begin when the U.S. enters World War II and carry on through the McCarthy era and the early Cold War years (i.e. 1941 to the late 1950s). This noir musical was Elvis’s final film before he was released by the studio to enlist in the army and showcases the dark, rebel image that meshed well with his sexually charged performance style. Noir content suffuses this film about rebellious young Danny Fisher (Elvis Presley), who is forced to move to New Orleans’ French Quarter by his unemployed and widowed father. He finds himself ridiculed by high school classmates then flunked by a prudish teacher. This leaves him tempted to release his anger in violence by a gang of young thugs and a ruthless mobster as well as his moll, a worn-out femme fatale. The film follows Danny’s struggles not to give up on his hopes of a more respectable kind of success. In addition to its dark plot and themes, King Creole is also identifiable as noir in its casting. 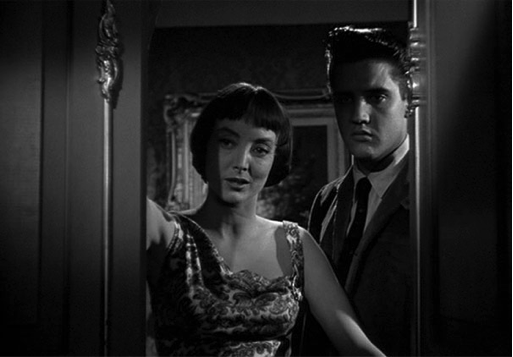 A number of actors familiar to noir audiences appear, including Walter Matthau (as mob boss Maxie Fields), Carolyn Jones (as Maxie’s moll Ronnie), Paul Stewart (as poor but kind club owner Charlie LeGrand), Vic Morrow (as hoodlum Shark), and Dean Jagger (as father of protagonist Danny, played by Elvis). Moreover, the film is directed by Michael Curtiz, of Angels with Dirty Faces (1938), Casablanca (1942) and Mildred Pierce (1945) fame. 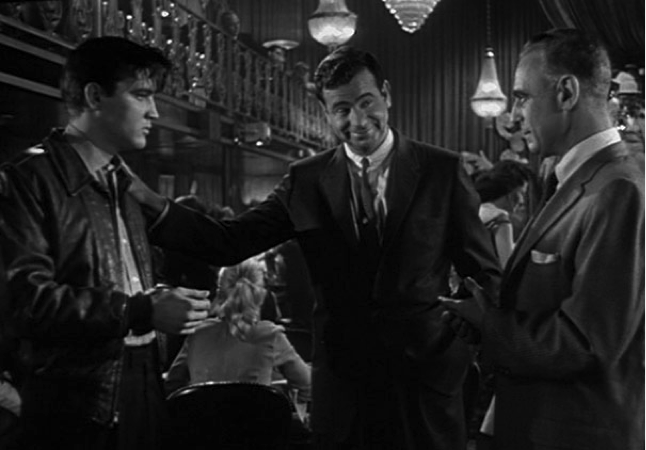 Mobster Maxie (Walter Matthau, center) competes with Charlie (Paul Stwart) to get Danny (Elvis Presley) to sing for his club. 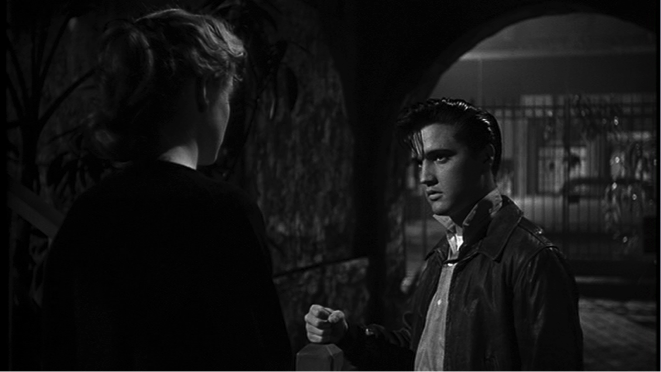 Rather than a romantic twosome centered in the frame, King Creole offers the hooded eyes and brightly lit fist of bad boy Danny and only the back of the innocent girl (Dolores Hart) he attempts to seduce. The background echoes Danny’s dangerousness with its shadowy alcove, high fence, and a dark, empty street beyond. Shadows across the faces of Danny and femme fatale Ronnie and tight doorway framing reflect the suffocating anxiety Danny feels. Most of the musical numbers are set in seedy clubs and rely on high-contrast, noirish patterns of light and shadow. Here Elvis is backed by the Jordainaires, a desexualized white group that reflects Danny’s move away from dangerous criminal darkness and the racial and sexual ambiguity of New Orleans. 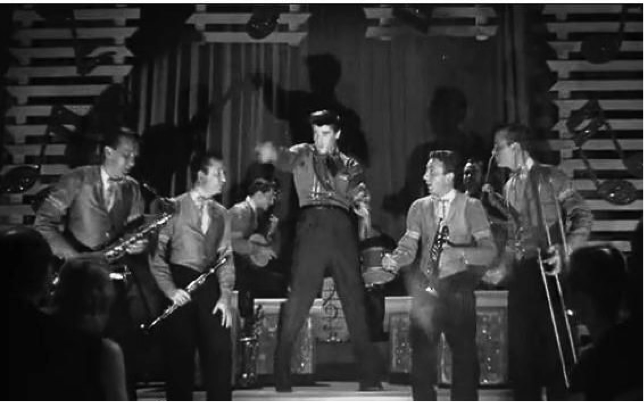 While some of the musical numbers are standard Elvis fare of the era, several reflect the New Orleans setting well, and a few seem particularly well chosen to highlight the film’s noir content and style. “Hard Headed Woman,” for example, a standard blues number written by African American rockabilly composer Claude DeMetrius, tells the age-old tale of strong women who bring weak men to ruin, including mention of Eve, Delilah, and Jezebel. The song points nicely to the danger of the femme fatale of noir, although the character of Ronnie turns out to be as trapped as Danny and functions as a sacrifice to violent men rather than their downfall. The film’s opening number, “Crawfish,” offers a particularly rich noir-inflected element related to race and sexuality. Danny sits on the balcony of the small apartment he shares with his father and sister (Jan Shepard), and joins in the morning chorus of Creole vendors selling their wares, from crawfish and berries to gumbo. The song is a call-response duet between Danny and a crawfish seller (played, uncredited, by African American singer Kitty White). Before this performance in King Creole, White sang two important songs in the classic noir cycle: “The Lullabye” in The Night of the Hunter (1955) and “Rather Have the Blues” in Kiss Me Deadly (1955). As critic Eric Lott observes in his article “The Whiteness of Film Noir,” race marks film noir, where almost all characters are white but “darkened” thematically and visually. New Orleans in particular is marked by racial and sexual ambiguity, in which Danny immediately immerses himself. He is told to come indoors but resists, singing “Crawfish” and greeting the prostitutes across the street at its conclusion. The symbolic struggle for Danny, in this opening context, becomes refashioning darkness (visual and moral blackness) into respectable light (whiteness). Racial overtones continue throughout the film, inflected by sexuality. In the film’s climax, “dark” Ronnie dies, and Danny can reconsider life with “light” Nellie (Dolores Hart). That Danny does not reject her but is not ready to consider marriage reflects the idea that he remains tainted by his experiences, including his romantic entanglement with Ronnie and his immersion in the racial and gender ambiguity of African American music and the life of New Orleans. His final performance, backed by the all-white Jordanaires (who replace the unnamed black blues band with whom he sings his first club number for Maxie Fields), suggest he is well on his way to purification. For fans of Elvis’s acting and noir cinema, it is unfortunate that this is his only venture into the dark style. When he returned from service, it was not to further develop his promising James Dean style but to star in trite Technicolor showcases for the Vegas-style performer “The King” would become.